Conveniently then, the climactic ABC special was taped in San Antonio, making it relatively easy to arrange a visit and companion interview with Como, who was 74 at the time and died on May 12, 2001 at age 88. Here’s how it went. This article originally was published in November 1986. SAN ANTONIO — It’s nearly noon on All Saints Day, and Perry Como`s fans are filing into the San Fernando Cathedral, awaiting a religious experience that, for them, transcends any celebration of a mere holy day. “Ahhhh-ah-vey Mah-REE-ee-ee-ahhh. Grah-see-yeah play-ay . . . Cut!” Como, caught in a momentary reverie, has missed his lip-sync cue. Unperturbed, he smiles and gently asks his cue-card man to be a little quicker on the draw. 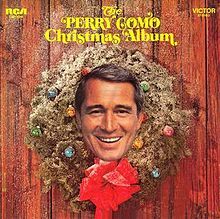 There is no loss of dignity, no sullying of the song that has become Como’s anthem as well as an automatic tear-jerker for the many who revere him as their host of Christmases past. This is Como’s crowd, already warmed by his bantering and unflagging good fellowship. Nothing can spoil the day. On take two, Como gets halfway through “Ave Maria” before it’s noticed that one of his shirt buttons is undone. A wardrobe man hurriedly re-buttons it before Como cracks, “See all this pampering now? I go home and my wife says, ‘Take out the garbage.’ “ His soft voice projects the joke only as far as the third row. The third try is the keeper. Como’s longtime musical director, Nick Perito, is crouched a few steps in front of his boss, silently and expressively urging him to give his heart to the song. A young crew member, perhaps one-third Como’s age, stands transfixed, his face softened by an unwavering smile. The cathedral is dressed in holiday decorations, Como`s fans are being blessed. For these admirers, it seems, Christmas will almost be an anticlimax this year. They have spent their holiday with Como. Having said amen to another “Ave Maria,” Como is in his trailer, resting before the short drive to the afternoon’s taping at the San Jose mission. He has quickly shucked his dress shirt, tie and light gray suitcoat for an outfit that more befits his “Mr. Relaxation” image. This sportier Perry wears a green-and-brown striped shirt and a green windbreaker. He thinks back to the 1984 Christmas special from London, which proved to be a crushing blow to fans. Como ended the show on a sour note, namely “O Holy Night” in place of “Ave Maria.” How could he? “I caught hell for it,” Como says. Never again, he pledges. “Ave Maria,” the Shubert version, remains the most requested tune whenever Como sporadically hits the concert stage. This is where he takes a stand. The version of “Ave Maria” to be heard at the close of the San Antonio special had been recorded two days earlier in a Los Angeles studio. All of Como’s solos are handled this way, even though he says, “I’m a terrible lip-syncer. We all know it, and I know it. 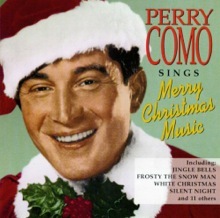 During his “Dream Along With Me” days, Como turned out 39 shows a season for NBC. 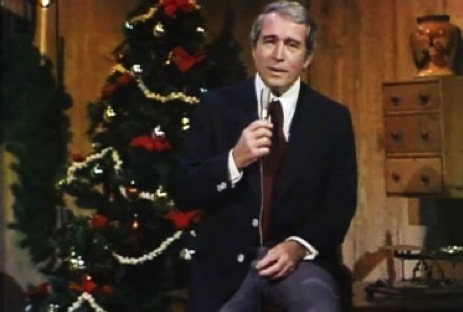 When “The Perry Como Show” ended in 1963, he starred in frequent “Kraft Music Hall” specials until 1967. But Como says there`s no business like yesterday’s show business. “We’re getting down to the people and touching them, and watching for their reactions,” Wynn says. During the taping at the San Jose mission, Wynn even has Como chasing after a runaway goat during the “Bless the Beasts and the Children” segment. Como sheds his coat, half-runs a few steps and then quits, throwing his hands up in mock resignation. Como and his wife, Roselle, whom he married in 1933, have two sons and a daughter and live in semi-retirement in Jupiter, Fla. Reared in Canonsburg, Pa., Perry is one of 13 children born to the late Pietro and Lucille Como. Pietro supported his family as a mill hand employed by the Standard Tin Plate Corp. Perry ran his own barber shop for five years until successfully auditioning for the Freddie Carlone Orchestra in 1934. He tries to continue, but his fans keep on trailing him. “You’re my era,” says a middle-aged woman getting around on crutches. “I’m everybody`s era,” Como says, signing a dollar bill for her. “The lover boy of the stone age,” Como quips. He signs a blood donor card and a little boy’s shirt pocket. He obligingly takes a picture with a fan. Small children are patted on the head and adults get a wink, a grin or a one-liner. Como cradles babies in his arms. He applauds everyone, whether it’s the equally gracious Dickinson or a priest offering a prayer during the taping in San Fernando Cathedral. Fans are ecstatic. Their hero stands taller than even they had imagined. As TV audiences watch him sing “Ave Maria,” however, he will not dominate the screen; the camera will pan to views of the cathedral interior and the happy crowd. “It’s a song that makes people think a little,” Como says. “So they’re going to show the beautiful paintings and so on.